One more NJ photo I forgot to post: this little baby bunny that hangs around Amy’s yard. He’s about the size of my fist, and can often be seen hopping about the front lawn or resting under one of the chairs in the backyard. Fidgety, but also rather brave, he let me get in this close before dashing into the bushes. 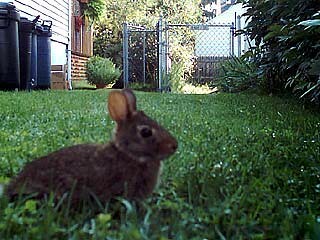 We used to have baby bunnies where we used to live. Come to find out, around here, they carry some really bad disease in their droppings. Why can’t they just be cute and not carry any baggage?